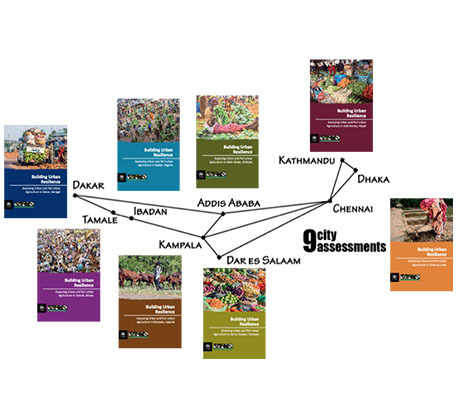 Between 2010 and 2013 START partnered with UNEP, WMO and partners from 9 cities across Africa and Asia to assess how rapid urban development and climate pressures converge to impact urban and peri-urban agricultural systems. Food production in and around cities is an integral part of the urban fabric in much of the developing world. Urban and peri-urban agriculture plays an important role in diversifying urban diets and providing environmental services. However, in cities experiencing rapid growth and transformation, agriculture faces intensifying pressures from urban encroachment, waste disposal, pollution, and climate change that may undermine the sector’s long-term viability. The assessments assembled and synthetized knowledge and provided information to support policy planning and decision making at the city level. They also identified knowledge gaps and strenghtened capacity within the research community, fostering networks of regional technical expertise, and encouraging communities of practice. Several of the 9 city assessment teams were comprised of a mix of locally based researchers and city government officials and the teams oriented their work around engaging stakeholders in shaping the focus and direction of the assessments from the outset to strengthen the direct relevance of the findings to decision making.